Blonder Slide Rule Wall Clock - Math Chic! 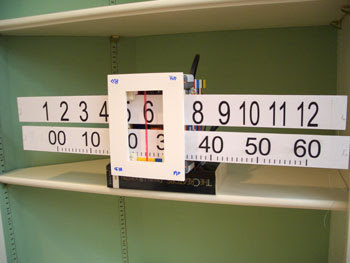 An interesting wall clock prototype inspired by a slide rule. Hours and minutes on separate rulers, meet at a central slider with retrograde motion for each cycle. 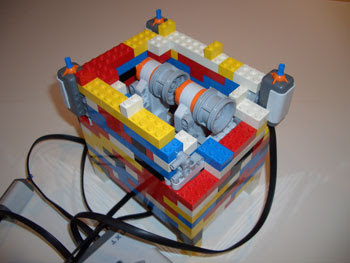 Mockup shown constructed from foam core and powered by LEGO Mindstorms. I previously featured inventor Greg Blonder and his seriously ambitious 1,000 year forest clock concept, the TiWalkMe (seen->here). The Watchismo Times is proud to be the first showcasing his latest timepiece project, the Slide Rule Wall Clock - on a much smaller scale than a entire forest but still very original. Blonder, inventor, physicist, entrepreneur, designer and former Bell Labs chief scientist has over 70 patents under his belt, many of which can be seen at Genuine Ideas and Talus Furniture. His page for the Slide Rule wall clock can be seen here. THE Japanese have never gained any notable degree of fame for their mechanical capabilities, but undoubtedly their reputations along this line will get vigorous boost by their invention of an automobile that runs by clockwork. Very little mechanical data is available on the construction of the new car, but it is said to have British car dealers doing business in Japan somewhat worried. This would indicate that the machine is more than just a freak that originated in the mind of a visionary inventor. Reports state that the car will run 40 miles at one winding. Further developments may see the invention of an eight-day machine. A Modern Mechanix and Inventions artist has caricatured the contraption above." via Modern Mechanix "Yesterday's Tomorrow Today"
Perhaps the next James Bond villain with plans to dominate the planet can time his greedy destruction with this newly announced Hysek "Colosso." Most obvious is the cyrstal pustule filled with a dimensional earth rotating for local or GMT time. And of course, appropriately priced for any haute dictatorship ($550,000). Retrograde time zones with a linear double display situated at the lower and displayed in curvex position with indication arrows that indicate which side to observe (24 to 12 hours / 12 to 24 hours). Transmission feedback, biplan, for time zone indications, made by 2 dials. 3 dimensions globe of 12mm diameter at 12 o'clock, considered as a visual GMT display turns on itself in 24 hours and can be set on local or on GMT time. "The 141 year old French watch brand LIP is reintroducing some of the most important wristwatches - a series from the early 1970s that remains as visionary today as when first unveiled almost four decades ago. These timepieces were created from a melting pot of Pan European industrial, architectural, interior and graphic designers, all given carte blanche by LIP to create some of the most original watches ever produced. Of the seven original designers between 1969 and 1976, Roger Tallon has made the most lasting impact. A true renaissance man of the mid-century. Tallon's contributions to the Modern era include the Teleavia, the earliest portable television, the world's first Helicoid staircase (part of the Museum of Modern Art collection), and the ultra modern French high speed TGV trains. His asymmetric Mach 2000 series has since become an icon for LIP with their unmistakable primary colored spherical pushers and crowns. The legacy of LIP evolves today in the hands of talented new designers like Prisca Briquet who are writing the next chapter of watch design in horological history". Below are some brand new images of the collection by the talented product photographer Michael Kraus. If you'd like to see some of the soon to be released images of the Fall/Winter 2008/2009 Lips-->contact me to be added to the first sneak peek email.